I got up this morning and the kids gave me their gifts. They had picked out a few things from the dollar store for me. Then got the kids off to school and went to the gym. I came home and got dressed, and Clint took me to eat at Copeland's for my birthday lunch. So good! I was getting ready to head to the mall to do a little shopping for me, when Veronica's school called. She has been having tummy troubles and she had a bad, bad accident during nap time. It was in her sleep and she didn't even wake up. Instead of the mall, I picked her up from school. I felt so sad for her. She was so embarrassed and also today would have been her first day of tumble bunnies and she wasn't able to go. No worries though, she seemed fine at home. Not sure what is going on with her tummy issues. Once Val was home we snapped some pictures and cut the cake. It was pretty darn good if I do say so myself! Then I got Veronica ready and took her to dancing. Every year for the past 10 years, I have gotten flowers for my birthday. This year - none. And it is a little hard to not notice. It's not really that I expect it, but I do look forward to it. So I mentioned it tonight - that I hadn't gotten any flowers this year. Clint forgot. Because of work. His wonderful job that has him totally oblivious to anything or anyone else. Work wins again. And he laughed when I said that. I don't find it funny at all. It's just another twist of the knife in my heart. There's so many theories out there about why time seems to pass faster as we age. Perhaps it's because sense of time changes. Perception changes. I can remember when summers seemed endless. Days and days of being home to play and school was eons away. I must have been around eight years old when I realized that summer was only June, July, and part of August. What ~ barely three months! I guess maybe I had finally grasped the concept of counting days, weeks, and months. Or maybe I learned how to use a calendar. I clearly remember thinking wow, summer this year isn't as long as it seemed last year. Now, the days slip by one by one and the months are soon behind us. I stay busy with the day-to-day routine, the kids, and a month isn't long at all. I can still remember being eight years old and in the third grade. My teacher was Mrs. Clawson and oh my how we hated her!!! I can remember her making fun of a kid in front of the entire class. (His last name was Meyer, and some of the kids would sing the "Oscar Meyer Weiner" jingle and she had the class sing it to him one day!!) I can tell you what desk I sat in and who sat around me. I had cut my hair super short - think pixie cut - that year. Thirty years ago. Wow. I can remember the summer I turned 18 like it was yesterday. A college freshman with a brand new car thanks to Mom and Dad. Young and clueless. Twenty years ago. Twenty-eight? Clint and I had just started officially dating. We were new and exciting together. We went out around Thibodaux to celebrate. How things have changed. How fast it seems the years have flown by. Happy Birthday to me! What will I remember about thirty-eight? Things have been quiet around here. Busy, but quiet. Can't complain about that! Clint has been in Denver most of the week. Today is a week since school has started and we're still getting our routine down. I find myself asking what day is it and who has to be where?! Haha. Valerie seems to enjoy her class and likes her teacher. She comes home every day with stories about her new friends, which makes me happy. Veronica seems to like going too and is proud that it's only her school now. Monday, Wednesday, and Friday mornings are rushed because the second Val gets on the bus, I have to race the clock to get Veronica at school before 8:30. As long as we get there before they stop serving breakfast we're ok. It's only six or seven miles, but some days it can take 30-40 minutes with fighting traffic to get there. Then Monday and Thursday evenings are busy because the girls have dancing. It's 4:30 when we get home, and we have to leave for 5:30. Valerie's class is a whole 90 minutes long ~ yikes. I have to figure out something to do while she is there besides shop! I miss them during the day, but I admit I'm glad to have a few quiet hours! I stay pretty busy though. My house is clean again and it is so much easier to grocery shop with out the kids. I can spend as much time as I want at the gym. I've even started riding my bicycle around the neighborhood. (Oh how I've missed my bike!) I do find myself watching the clock though and anxiously awaiting the bus! My heart aches, yet I'm so proud at the same time! Gosh, all I can think of is the years of having my little girl home with me are gone. We had a lot of fun ~ play dates, outings, visits.... Part of me still thinks maybe I should have done *more* with her. Where did all the years go?? I just want to put my arms around her and hug her so tight and never let go. I wish she could stay five forever. She's off to school.... kindergarten!! Big school for my big girl. Today was Veronica's first day of preschool. I was curious about how she would handle going by herself - as in with out Valerie. It didn't seem to phase her. Roni hopped out the car and ran inside. She seems to have had a great first day in her new class. Today Valerie had her testing (she did awesome) and we met with her teacher. It's hard to believe I'll be the mom to a kindergartner in just a few days. Yikes. 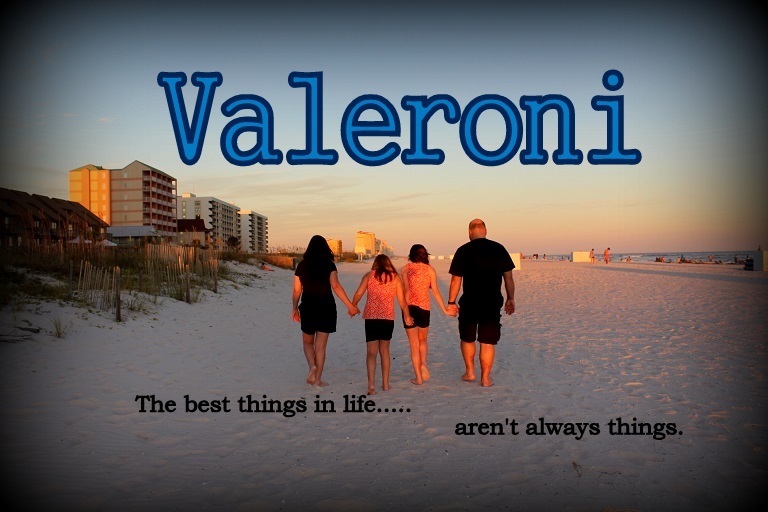 My Valerie is growing up. At times she seems wise beyond her years, yet I still see her as such a little girl. I'm so glad I was able to have her home with me all this time. Special times that I'll never forget. Can't help but be a little sad that she's off to big school now. Sigh. I'm nervous about this new adventure but I am trying not to let on. I don't want Valerie to think she has anything to be worried about. She's so excited. I know it'll be fine once we are used to the changes! I think I am more anxious about the bus than anything, and the school isn't helping much with answering my questions! Val still seems so little to get on a big bus all by herself. She wants to though, so I'm going to let her give it a try and be independent. I have a feeling this whole public school business is going to be a learning experience for the both of us! So many ups and downs lately. I spent many hours of my life watching the world through this window. It's the window over the kitchen sink at my parents' house. I watched for my Dad to get home from work when I was a child. I watched for friends to come visit. I waited for the bus. When someone rang the doorbell, we peeked out the window to see who was there. I anxiously waited for dates to arrive. We watched for the mail man when a package was expected. And so forth. I suspect my Mom spent many hours watching and waiting for me out of this window as well. This day was no different. We were huddled in the kitchen, watching and waiting. Many tears had been shed. The hospice nurses had come and gone after making their phone calls and filling out paperwork. My aunt and cousins had left. It was just us - my Dad, Clint, the kids, and myself. We were in the kitchen just feeling overwhelmed when we saw the glint of sunshine off the long, shiny, black car that slowly pulled into the driveway. "There they are," we said. It's been two years since we ushered the girls outside to play on the rusted swing set in the sweltering August heat. They didn't complain though because like most kids, I don't think they noticed how smothering hot it was. Up until that moment, I never really thought about how they would come get her. It never occurred to me that a hearse would pull into the driveway, but it makes sense now. I didn't want the kids to see the 'fancy' car and ask questions. I didn't want to see them take her away either. They didn't know yet. So we hid in the backyard and let them do their work quietly. I made sure the driveway was empty before going back inside. The second the hearse left, a woman who lives two houses down rang the doorbell. She just looked at the five of us in horror as she figured out who was missing. She cried over and over "I'm so sorry! I'm so sorry! We had no idea she was sick!!" Another man who lives down the street stopped to give his condolences. He had seen me in the driveway a few days earlier and asked what was going on, as he had noticed the big white hospice vans coming and going. Part of me felt relief that it was over. There would be no nursing home after all. The days and nights of waiting and watching and not knowing were behind us now. Yet it was just a beginning. Sleepless nights and just overwhelming grief. Sadness and always the feeling of missing someone terribly. And knowing you will never, ever see them again. And two years have flown by. She's been gone two years today. Unreal. Even my Dad told me a few days ago it was still hard for him to believe all of that really happened. It has gotten better over time, but not exactly easier. I've adjusted, but it's always there.